The first part of the puzzle is a side effect of getting a solar water panel; to make the most of the solar panel we should only be using the boiler to top up the hot water at the end of the day. (Obviously that’s just theoretical at the moment because its pretty much been raining non stop since we got the solar panel!) Unfortunately the current central heating controller will only turn on the heating if the hot water is on at the same time, which is no help at all, so we really need a new controller to make the most of our zero carbon supply of hot water. There’s another, purely aesthetic reason to want a new heating controller; the kitchen upgrade got under way this week and the old controller has seen better days. The current kitchen destruction has a bigger part to play though; now is an ideal opportunity to hide cables behind the new cupboards. For a while that didn’t actually seem like it was going to be all that much help, based on where the old thermostat was (hidden behind a door in the living room). I was looking at various programmable thermostats but the existing wiring from the thermostat restricted the options somewhat. The programmable thermostat we had in the old house seemed to work quite well with the existing wiring and controller… as long as the battery was fresh, otherwise it got confused about the temperature. 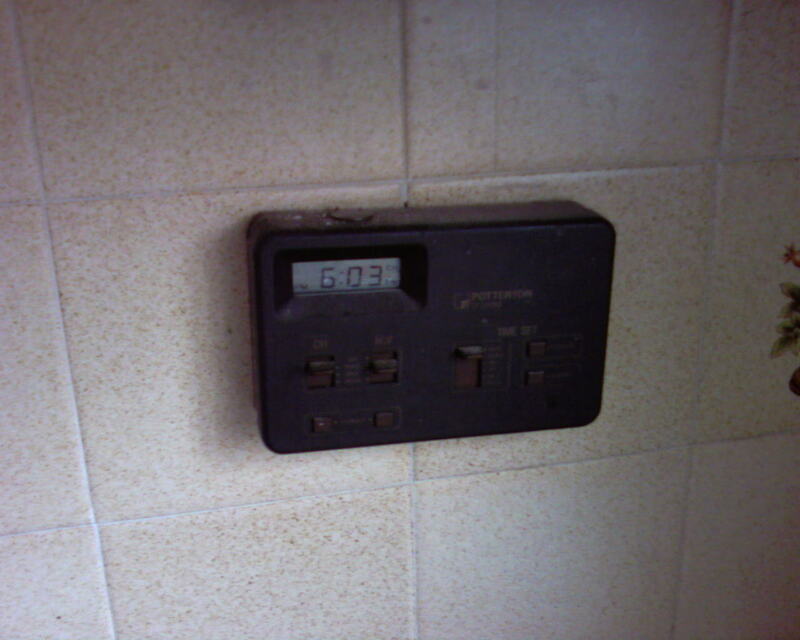 Obviously not ideal for a thermostat, so I was hoping to avoid batteries this time! 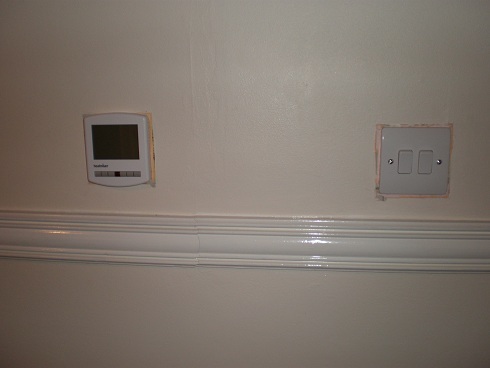 The thermostat to finish off this puzzle is a Heatmiser combined programmable thermostat and hot water timer. My theory is that I need the PRT/HW-N thermostat to go in the living room and a PRC powered relay card in place of the old central heating controller. I’m almost certain that the wiring will work with the existing system anyway, but if anyone has any experience/tips/gotchas, please let me know! That programmable thermostat should give me an RS485 interface to the thermostat which, if all goes well, won’t be too difficult to connect to my nanode– either with a bit of soldering, or one of these IO shields if I’m feeling lazy! The thing I like about this arrangement is that it should be possible to achieve plenty of automation if all goes well but, if there are any technical hitches, there’s a decent off the shelf controller to fall back on. The black cable is the valve, and the other two cables that enter with it at the bottom are the pump and cylinder stat. It looks to me like the grey cable should be to turn the hot water off, which seems to be connected to the cylinder stat and a red wire from one of the cables above, which I’m hoping is from the timer. That just seems too easy for this house though, and I’m a bit puzzled by what the connections on the orange wire actually are. Lucky it’s all neatly connected and labelled so I can check the orange wire is connected to the cylinder stat and pump… bother. I guess I’m going to have to wait until Jo’s not looking so I can investigate more thoroughly! This entry was posted in Ones and Zeros and tagged arduino, central heating, controller, eightbar, heating, heatmiser, homecamp, house, kitchen, nanode, new house, PRC, PRT/HW-N, relay, rs485, solar, solar thermal, timer, zero carbon by jt. Bookmark the permalink. I have been musing about smarter heating controllers for several years – and subsequently cobbled one together from an Arduino MEGA and a Nuelectronics sensor shield. 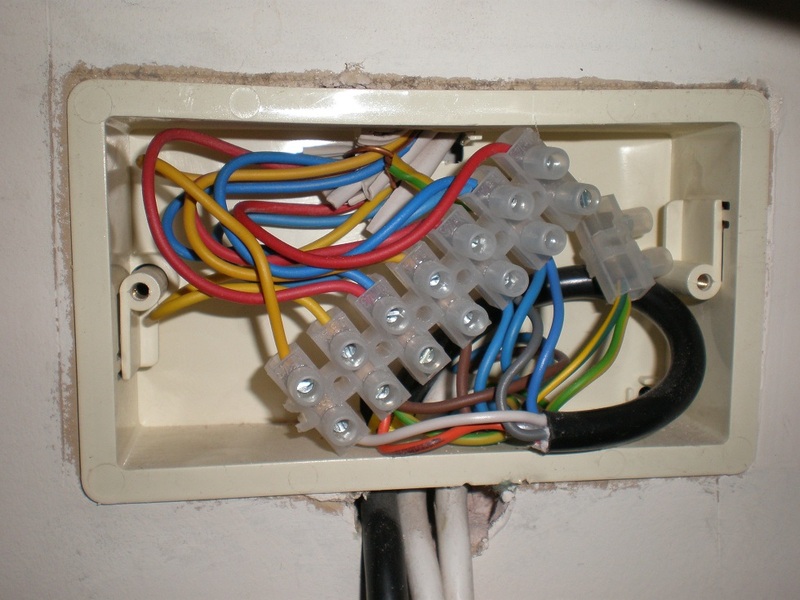 Whilst most home energy monitoring and saving has been centered on electricity – the elephant in the room is clearly the UK’s outrageous gas usage – because of the crappy heating controllers we have been using up until now – 2 relays, a timeswitch and a thermostat (often mounted in the wrong room) barely constitutes an efficient control system. We now have all the open source building blocks available to do something better – Arduino, Nanode, Cosm (formerly Pachube) and Android or iphones. There is no excuse not to get our minds together and come up with something open source and considerably better. How did the Arduino MEGA/Nuelectronics sensor shield work out as a heating controller? I was thinking along the lines of nanode plus 1-wire sensors but maybe a Raspberry Pi would be easier. Either way, I’m hoping that an ethernet socket next to the boiler, with a relay card replacing the old controller, should experimenting reasonably easy. With recent interest in the Nest thermostat, it could be a good time to get some troops behind an open source heating control system. Sorry about the double posting – but I was convinced that WordPress had eaten my first post, when it asked me to login. Certainly, basing it on a R-Pi would quickly allow algorithm development, and also help to establish a community. However, I’m guessing that the owners of new Pi don’t want to tie them to such a mundane application. The MEGA worked out well, I added five temperature sensing thermistors, an analogue pot for setpoint temperature entry, a 4 x 20 LCD alphanumeric display and a 433MHz transmitter module. The 433MHz transmitter just sends faked “boiler on” and “boiler off” packets to the existing Drayton Digistat wireless receiver. 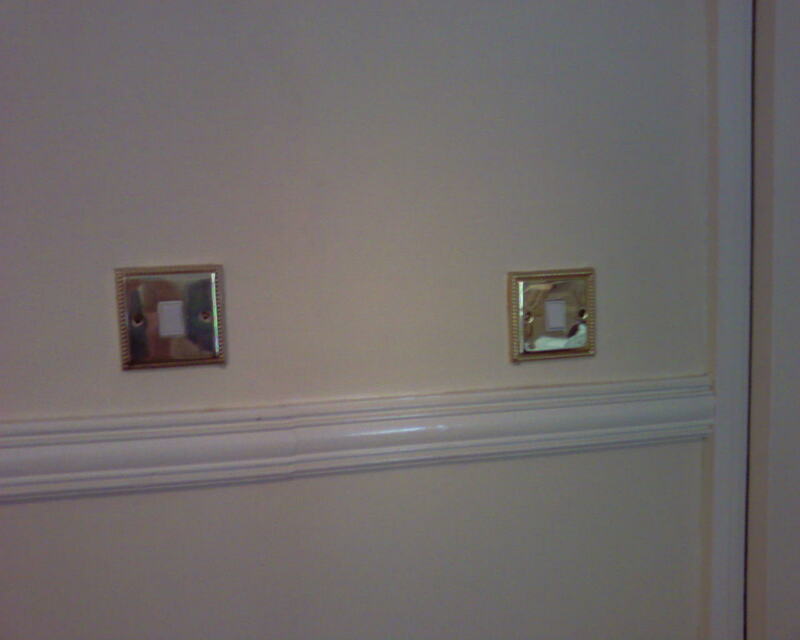 Two relays are used to select either or both heating and hot water. I sense the living room temperature, the workroom temperature, the outside temperature and the temperature of the top and bottom of the hot water tank. The real time clock on the sensor shield allows me to schedule various heating/hot water on off events based on time of day and day of the week. I can also base the control on the outside temperature – for example if it’s 4am and the outside temperature is less than 5C, then bring the heating on early so that the house is up to temperature by 7am. The MEGA also handles gas consumption monitoring (a work n progress) and also has the means to control a few thermostatic radiator valves, to allow different temperatures in different rooms. Conrad Electronics sell various wireless TRV actuators – that fit a range of EU manufacturers TRVs – so can be retrofitted. Whilst this experimaental system has wired thermistors, a series of low cost wireless sensors and TRV actuators would be preferable for most households. A retrofittable wireless heating controller with the standard “backplate” would be the simplest way to integrate this system with existing household systems . If I had more time available in the UK, I’d get the system finished – but now it will have to wait until August. So far domestic energy monitors have focussed on electricity monitoring – whereas clearly our primitive and inadequate heating control systems are nationally wasting vast quantities of natural gas. We now have all the open source tools to do come up with a much better monitoring and control solution – Arduino, Cosm (formerly Pachube) and Nanode. Two relays, a timer and a thermostat barely constitutes an efficient modern heating control system – It’s time to get the movers and shakers of the open source community together to address this national disgrace. I believe the Warmworld controllers have what they called a ‘fuzzy logic’ brain. It learns from our living patterns & the rate of heat change achievable. We just set the temperature we want it to be at which time of day & it controls the boiler to get that result. It’s at least 12 years old so not a new idea. It just works. Now we just need to get the air-change (infiltration) rate as low as possible in our rather-too-leaky house & we’ll use even less fuel (oil in our case).